A Customs officials on duty inspects a young passenger's luggage. A Customs officials on duty inspects a young passenger’s luggage. U.S. Customs and Border Protection, the agency responsible for securing U.S. ports of entry and international borders, is accepting applications nationwide for officer positions at select locations, including Charlotte Amalie, USVI and San Juan, the agency announced. 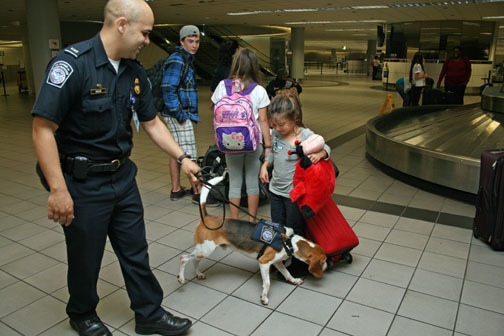 As a component of the Department of Homeland Security’s frontline defense, a CBP officer’s primary responsibility is to detect and prevent terrorists, their weapons, and other threats from entering the United States while facilitating legitimate trade and travel. This requires enforcing more than 400 laws related to trade, contraband, agricultural pests and diseases, and admissibility of individuals. An applicant for the CBP officer position must be a U.S. citizen and a resident of the United States for the past three years; must be referred for selection prior to their 40th birthday (preference-eligible veterans or those with prior civilian federal law enforcement experience are exempt from maximum age requirement); possess three years of general work experience or a Bachelor’s degree in any area. In addition, applicants must pass an entrance examination, medical examination, physical fitness assessments, structured interview, drug test, background investigation, and polygraph examination. CBP offers an opportunity for veterans to continue serving their country in an environment that appreciates the hard-earned knowledge, skills, and abilities veterans gain through serving on the front lines. For selected candidates, CBP offers paid training to fully prepare them for an exciting career in federal law enforcement, the opportunity to serve the country, and a competitive salary and benefits package. CBP is an equal opportunity employer and encourages women and minorities to apply. For more information on the CBP officer position, click here. For additional information, contact B. Padial at 787-552-3005 or 787-749-4286. To apply for the CBP officer position, applicants must have an active USA Jobs account and complete an online application at www.usajobs.gov. Hey Buddy!, I found this information for you: "U.S. Customs hiring for officer positions nationwide". Here is the website link: https://newsismybusiness.com/customs-positions-nationwide/. Thank you.